Mohamed ElBaradei became an internationally known figure when George Bush’s administration decided to go to war with Saddam Hussein, on the pretext that Hussein was producing and stockpiling weapons of mass destruction. ElBaradei’s courageous report to the UN Security Council that no such weapons were found by his inspection team, defied the US position that sought to justify going to war and sealed his stature in the world community as a man of honour. 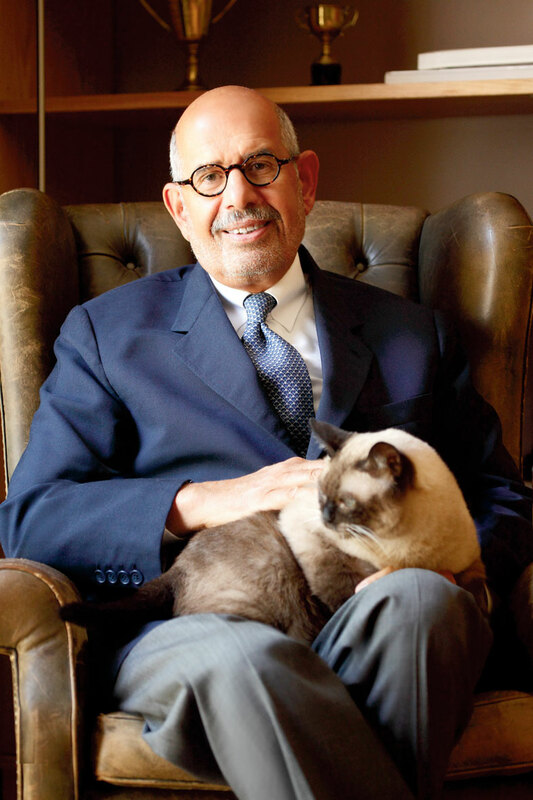 As a result, ElBaradei won the Nobel Peace prize in 2005 and his insights were more respected and in demand than ever. From then on, to millions around the world his name became synonymous with integrity and courage. And no one was more proud of him than his fellow Egyptians. Since he left the IAEA in 2009, in an effort to give back to his country, ElBaradei has been speaking out on the need for political reform in Egypt, in order to improve conditions for all. Some call him a dreamer, some call him an idealist and some think he is needlessly rocking the stability of the status quo. Yet no one can doubt his courage, integrity and love for his country. On a sunny morning this fall, eniGma’s Editor-in-Chief, Yasmine Shihata, sat down with the award winning Nobel Laureate at his Cairo home to hear his views, in his own words. For the first time, the exclusive interview ahead gives an insight into the man behind the Nobel Peace Prize and his vision for the future. Thank you, it’s my pleasure to have the opportunity to connect with young people, through your magazine. My background is not much different from many other Egyptians. I grew up in Cairo, went to an Egyptian school, then to law school here. I then joined the Foreign Service, and served in New York and Geneva. After that, I joined the United Nations in 1980 and taught law for a number of years in New York. I then joined the IAEA, and moved up its ranks until I was elected Director General in1997 and remained in the post for 12 years. In the course of my career I got a doctorate in International Law from New York University (NYU) where I learned the real value of education; learning how to think, examine a problem and try to find a solution through being open to new ideas. I always believed that was an important milestone in my life; to be exposed to a free society, to be able to think freely, to be able to learn and use all the tools available on how to cope. This has helped me throughout my career. Was this education a turning point in your career? I think so. One of my mentors, Tom Frank was a professor at NYU, he was a great man who sadly passed away last year. He’d always focus on the big picture and not on the parochial approach to resolving issues and that’s something I learned from him. I understood that we’re living in a world where there are a host of issues we can’t resolve unless we look at the broad picture. Whether you are talking about HIV AIDS, arms control, weapons of mass destruction, communicable diseases or climate change. For all these problems and many others, we cannot find a solution unless we work together. That understanding attracted me to work from an international perspective. After all we are one human family and we need to move forward based on cooperation and not confrontation. It’s not a zero-sum game, it’s a win-win situation, either we are all going to win or we are going to lose together. Of all the issues you have been involved in throughout your career, which is closest to your heart? There are two issues: global inequity and global insecurity. I can tell you numbers that are horrifying: half of our world, nearly three billion people, live with under $2.50 a day. According to the World Food Program there are one billion people who go to bed hungry every night. One percent of the world population owns forty per cent of the world’s assets and conversely fifty percent of our fellow human beings own just one percent of the world’s assets. This is not sustainable. Poverty is the most lethal weapon of mass destruction. The other issue, of course, which is linked with that, is global insecurity. We live in a world where the nine countries that have nuclear weapons are telling everybody else ‘you cannot touch nuclear weapons because they are not good for you, but they are good for us as a deterrent that protects our security’. Again this situation is not sustainable. So these are the issues I am focusing the rest of my life on because, particularly in this globalized world, it is absolutely clear that we must change our mindset. We must understand that irrespective of our ethnicity, language, or skin color, we are all part of the same human family. We have the same hopes and the same aspirations. Do you feel the West is right in its stand against Iran’s nuclear aspirations? Is it really a cause of concern or is nuclear energy a good alternative for developing nations? We have to differentiate between nuclear energy for peaceful uses and nuclear energy to generate weapons. There are now thirty countries using nuclear energy for electricity. In France they rely on nuclear energy for seventy eight per cent of their electricity supply. It’s a clean source of energy that gives countries energy independence and it guards against fluctuations in energy prices. And for developing countries energy is the key for development. Iran of course is already using nuclear energy now. But there are concerns about whether it is moving towards a nuclear weapon. This is a very complicated issue which goes back fifty years when the West toppled the first nationally elected government in Tehran, the Mossadek government. Then came the US hostage situation in 1979. Since then there’s been a huge area of distrust between the US, in particular, and Iran. Iran may have thought about developing nuclear weapons back in the mid-80s when they were engaged in a horrific war with Iraq, and Iraq was using chemical weapons against them (with the support of the West and Arab countries), in order to contain the so-called Iranian revolution. At this stage, Iran probably wants to develop the technology and know-how to allow them to develop nuclear weapons in a short space of time – in a year or two- but not to develop an actual nuclear weapon, thus remaining “kosher” so to speak and in compliance with IAEA rules. In that sense Iran would not be different from Brazil, Japan, or Germany who also have the technology to do so. But the Iranian situation is primarily a competition for power and ideology between Iran and the West. We have to look at the big picture. We are basically talking about a question of intentions in five or six years down the road and you cannot deal with intentions except by building trust. I continue to be optimistic, however. Sooner or later the Iran issue has to be resolved and it can only be resolved through building trust and peaceful negotiation. And the solution to Iran will be the gateway to stability (or instability) in the Middle East, as the ongoing problems in Iraq, Afghanistan, Syria/Lebanon and Palestine cannot be resolved unless we engage Iran as a powerful partner in the Middle East. After this illustrious career abroad, what was your initial reaction upon your return to Egypt? This is a new Egypt for me. The Egypt I grew up in was multi-ethnic, multi-cultural, liberal and tolerant. Egypt now has become one-dimensional, conservative, less tolerant, and much more repressive. Although repression has been going on for many decades, I am old enough to have seen an Egypt that had a liberal democracy – which was not perfect as we were still colonized – but still there was much more freedom to speak out and establish parties. We also had different nationalities then living side by side. I grew up with friends and colleagues who were Italians, Armenians, and Jews. Egypt also used to have an excellent education system. We had an elite that was not dissimilar to any other in the West. We were part of the world in many ways. We were contributing to civilization. Now education is almost nonexistent. Today I ask myself ‘what are we contributing to civilization? Where is our role in industry, literature, art, and the humanities?’ Twenty eight percent of Egyptians are illiterate. There is no excuse for that in this day and age. In Cuba, which was under sanctions for forty years, the literacy rate is one hundred percent. We have, unfortunately, continued to disconnect from the rest of the world. At a time when the world has leaped forward, we have gone backwards steadily. This doesn’t mean I want to send a message of doom and gloom. Egyptians are fantastic people, they have a lot of abilities and they have proven themselves around the world, but Egyptians need the proper framework in their home country to succeed here too. How else can you explain, for example, that there are over 15 brilliant Egyptians on the faculty of Harvard University alone! What kind of obstacles do you face when you encourage people to stand up for change? My activities are obviously curtailed in subtle and unsubtle ways. For example, I can’t establish headquarters for my organization, the National Association for Change, as we are not officially registered as a party. And of course I will never think of establishing a party within the current system where ironically you have to ask for permission from the ruling party to establish a party seeking to change the status quo. Many of my supporters are also detained because they go around the country educating people and asking them to sign a petition for change. I also do television interviews that sometimes are not aired. But luckily I am able to do interviews all over the world, as I feel we need to make people aware everywhere of the problems we are facing in Egypt. I see Egypt’s issues as issues of human values that cut across borders, language, or nationality. And they have to be respected everywhere. Having spent a lot of time with young people in Egypt, what do you see as their biggest concerns for the future and how do you think you can help? Young people are the ones who are really concerned about the future. Much of the so-called elite or educated class, have been corrupted in many ways; either they are beneficiaries of the regime or have already lost their courage, integrity and ability to speak up. I always wonder where is Egypt’s so-called middle class and upper middle class? We have 450 thousand lawyers, why do they not stand up for change? We have almost 100,000 university professors, where are they in leading and educating the people? The ones who are really doing the heavy lifting are the young people and the lower middle class, because they can’t even make ends meet. The young people are very concerned about their future and I’m absolutely impressed by the work they are doing. I am also very eager to make them understand that change cannot come through just one person or through a savior. We have 7,000 years of history where people looked at one person as a Pharaoh. That is precisely what we need to change. We need to build institutions. Yet when I see Egypt’s new generation, I see hope. I see the new Egypt. I am not their age but we are on the same wavelength. Currently university students are not allowed to gather politically or to discuss politics. How do you feel about that? Universities are the place to educate young people to participate. Politics is a sense of participation. To say that you can’t talk politics at university is to say you cannot think while at university. You are limiting students’ ability to think for themselves. Egypt will not move forward unless we empower the people, particularly the young people, to think, be free, move and create. As long as students are following proper rules and work in a peaceful environment, by all means we should encourage them to do so and to dream about the Egypt that they want. If you had the opportunity, how would you improve Egypt? The first thing we have to do is create a new constitution, and your late father, Dr. Ibrahim Shihata, wrote a lot about this. We need a new constitution that is based on a balance of power, with checks and balances, with an executive that is not overly powerful, with an independent judiciary, and free and fair elections. And then we can let the people decide what they want. I believe in true democracy; because once you have a democracy, everything else will fall into place. Democracy means you choose who you think are the right people to govern and if they don’t deliver you can change them. Democracy means that any program, whether in education, healthcare or anything else, reflects the people’s priorities. Of course you may go through hiccups in a democracy, but the system corrects itself. Let’s talk a bit about your activities on Facebook and Twitter. How do you feel about the power of social media ? Well, around the world I am a real person with influence, through my ideas and writings, but in Egypt I am a Facebook person, in many ways. But it has been great. A lot of my Facebook supporters turned into volunteers going around the country explaining to people what change means for them. So although we began through the internet, we’ve now started to go on the ground. Tweeting is also something I never knew anything about before. I find it extremely useful because the next morning my tweet is in an independent or private newspaper in Egypt or printed elsewhere around in the world. How do you juggle all the different commitments you have in Egypt and internationally? It’s very difficult. I’m busy writing a book about my experience during the 12 years I was Director General at the IAEA, when I had to deal with the Iraq situation. It’s really important to provide my historical perspective on how these issues have been dealt with and what we can learn from that. I’m also sitting on a lot of boards, like the International Crisis Group, which is a very prestigious and respected group that deals with different global security issues. In addition I have many lecture commitments around the world. It’s very important to me to represent an Arab voice, an Egyptian voice, a Muslim voice, on the international scene as unfortunately there are too few of us doing that. Of course, I also meet with Egyptians abroad to discuss how they can be more engaged in their country’s future. Do you see yourself spending more time in Egypt now? Yes, I hope things will settle down by the end of the year, especially since I hope to have finished my book by then. And next year is a crucial year, as it’s going to be an election year in Egypt and there is a lot we expect to happen. I would like to be here to participate with my fellow Egyptians to help steer things in the right direction. When you’re not juggling all your responsibilities, how do you enjoy spending your free time? I have many hobbies. I believe my self worth does not come just from work, it comes from my inner self. You have to have a life other than just going to work or talking about public issues. My hobbies are a distraction and I love them. For instance, I have a love for antique carpets. When I’m in Vienna I go regularly to visit my friend who is a carpet dealer and I exchange and buy carpets. It’s an art. I also love modern art and collect it as well. I love classical music and jazz. It depends on my mood. Classical music is very structured, very cerebral. But I’m getting more into jazz now, and I especially like Miles Davis and Jack Herrera. I like the spontaneity. I live a very structured life so I feel I can let go by listening to jazz. And of course the greatest joy of my life is my granddaughter, who is now two years old. I spent two whole months with her when I was writing my book in France last summer; preparing her favorite baguette with butter and honey and teaching her how to swim. These are the kinds of things I do in my free time. I also have my small group of friends with whom I can have fun and discuss many issues. The ideal for me is to be able have fun with people but also learn something in the process.